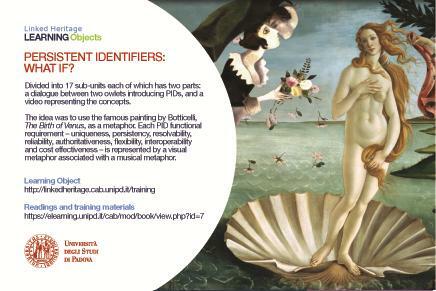 A personalised learning environment consisting of a series of learning objects aimed at key audiences in the cultural heritage sector. 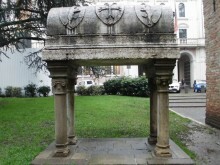 In the frame of Linked Heritage, a comprehensive training programme has been designed and developed by the University of Padova with the help and contribution of all the partners. The Linked Heritage Learning Objects were produced thanks to the support of music composers and performers, multimedia project experts, young geeks, photographers, camera operators, set designers and illustrators who gave the project their talents, availability and work for free. market players from the private sector. 1. Persistent Identifiers: What if? This Learning object consists of two parts: on the left of the screen, a dialogue between two owlets introducing PIDs and, on the right of the screen, a video showing the concepts. Each PID functional requirement is represented by a visual metaphor associated with a musical metaphor: uniqueness, persistency, resolvability, reliability, authoritativeness, flexibility, interoperability and cost effectiveness. Persistent Identifiers: What if? 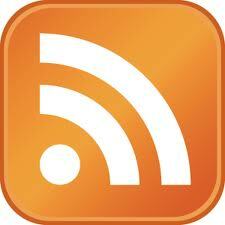 is available in the following languages: English, French, German, Greek, Italian, Polish, Sweden and Spanish. 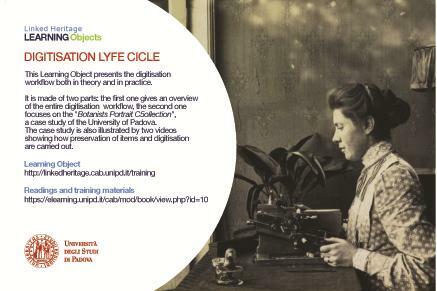 This learning object presents the digitisation workflow both in theory and in practice. The first part gives an overview of the entire digitisation workflow based on the digitisation guidelines of the University of Padova Library System provided by the Phaidra working group. The second section focuses on a case study of the University of Padova the “Botanists portrait collection”. The case study is illustrated by two videos showing the preservation of items and digitisation. Digitisation Life Cycle is available in the following languages: English, German, Greek, Italian, Polish, Swedish, Spanish. 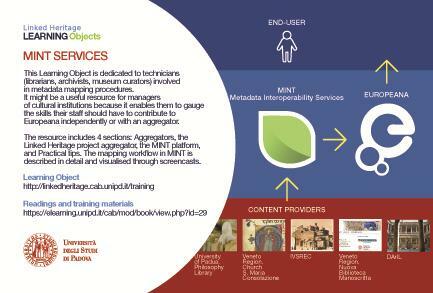 The Linked Heritage aggregation methodology and the mapping workflow in MINT – the technological platform developed by the National Technical University of Athens (NTUA) – is thoroughly described along the learning object. The user can follow step by step the mapping workflow by means of a sequence of screencasts. Furthermore the learning object gives practical tips to technicians dealing with specific mapping activities as for example how to set metadata and digital object rights in MINT. 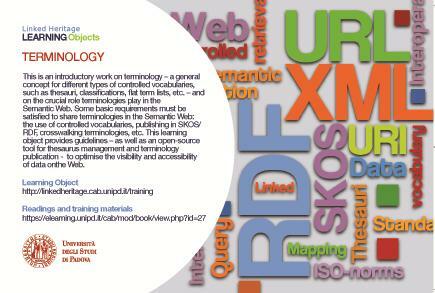 The learning object is enriched by the training materials and further readings. MINT Services is available in the following languages: English, Spanish and Swedish. Why and how to contribute to Europeana describes the motivations for which cultural heritage institutions should contribute to Europeana. It also examines the University of Padova experience. The learning object contains the description of our Atheneum’s main technical steps, the workflow and some administrative information. 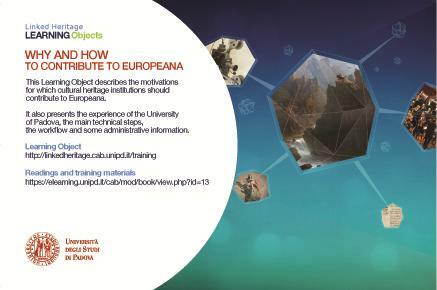 Why and how to contribute to Europeana is available in English and Sweden. This LO describes a series of case studies on persistent identification presented by Linked Heritage partners led by EDItEUR. These studies point out the differences and similarities between the commercial media and cultural heritage sectors. 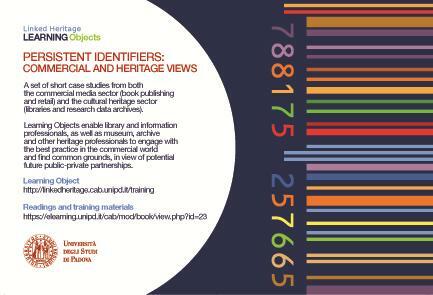 Persistent Identifiers: Commercial and heritage views is available in English, Greek and Swedish. This tutorial explains the following subjects in a simple and practical way: the notion of terminologies and their importance in enhancing digital content; step by step guidelines on how to improve your vocabulary on the world wide web; an introduction to the terminology management platform (TMP); an introduction to the Simple Knowledge Organisation System (SKOS); an overview of the most recent literature and websites. Terminology is available in English. This learning object presents an overview of the “state of play” for trade companies wishing to offer their product data to Europeana, with pointers to freely-available tools and documents contributed by EDItEUR to support this process as part of the Linked Heritage. It describes: what Europeana is and does; why it may be valuable to the commercial sector; any relevant legal questions; technical services available to support collaboration. 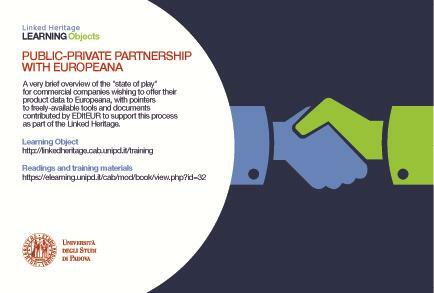 Public-Private Partnership with Europeana is available in Bulgarian, English, Spanish and Swedish. 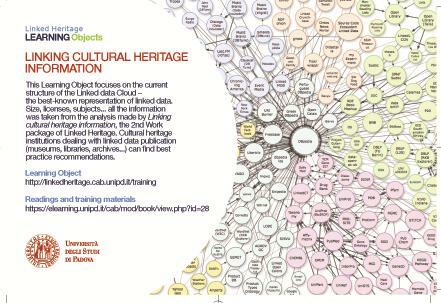 This Learning object focuses on the current structure of the Linked data Cloud – the best known representation of linked data and on the benefits for the cultural heritage institutions. 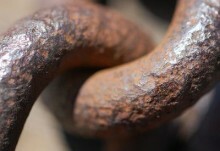 Thanks to Linked data – especially Linked Open Data – they can enrich knowledge and improve their visibility on the web. Linking cultural heritage information is available in English. Click here to access the Linked Heritage Virtual e-Learning Environment. 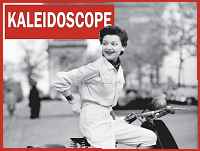 Click here to see the article published on the Europeana blog. Linked Heritage demonstrated the publication of Linked Data to the digital cultural heritage community, including the establishment of a linked data server which delivers our metadata as linked data triples. To identify the most effective way for the cultural heritage sector to create, manage and apply permanent identifiers. On 6, 7 and 8 March, Padua hosted a plenary meeting between the partners of Linked Heritage, the project founded by the European Union in order to increase the quantity and quality of the content provided to Europeana - the great European digital library - from the public and private sectors.